Well they didn't quite finish the house today, they'll be back tomorrow. Here is a pic from the other day, I think it was Thanksgiving. I will get some pictures when they finish. 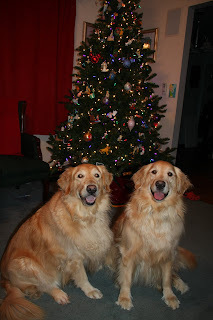 Also a pic of my adorable doggies, don't they look like angels...pictures lie!! Aww, they look so precious! 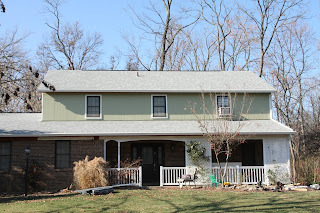 Love the tree and the trim does make the color of the siding pop! Nice!!! How do you tell them apart? They look very similar in the picture. Much like a mother with twins, they are easy for me to tell apart. Plus they act nothing a like. My mom ties a ribbon around one while we gone so she knows who is who at a glance. I love their faces! The one on the right has a very cute smile look. She looks playful and silly. They are gorgeous dogs! I love the color of your house. It looks so nice! I'm glad it is almost done. Your dogs are so cute! The house looks great! I love it! the one on the right is violet, she is playful and silly BUT also rotten, spoiled, wild and nuts.